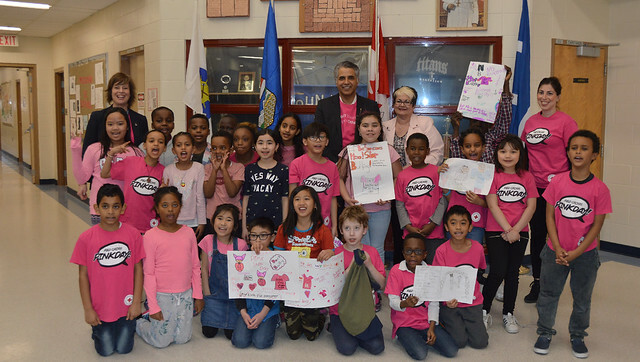 Community and Social Services Minister Irfan Sabir with School Trustee Linda Wellman celebrating Pink Shirt Day with students at St. John XXIII School in Calgary. Pink Shirt Day began when two young students in Nova Scotia supported a classmate who was being bullied for wearing a pink shirt. The initiative is now an international movement, and Albertans celebrate it every year. This year, everyone is encouraged to wear pink and share pictures of themselves on social media using the hashtags #PinkShirtDay and #EndBullyingAB to help raise awareness about bullying and the ways people can get help. Use the Alberta.ca/BullyingChat available daily from noon to 8 p.m.
Get more information at Alberta.ca/bullying. Taking responsibility for your mistakes. Telling someone if you are being bullied or witness bullying. Listening to those who are experiencing bullying, providing support and encouraging them to seek help. Being respectful, kind and supportive of others. One in five Canadians aged 15-29 report being cyberbullied. One in five children is affected by bullying. Women face a higher risk of being bullied than men. 85 per cent of bullying happens in front of others.